What would you have done if you lived in the land of the Igbos, long before contact with the Western world. A land where every one was bound to follow strong established rules. Decency and decorum was expected, as well as self-control. Any excessive or obsessive expression of one's feeling was totally unlooked-for. One day, you found yourself a widow, not once but twice. With time you got over it and fell in love again. However, you couldn't marry the man you loved because he had been betrothed to another woman when he was a child as custom required. Besides, even if you were reputed to be one of the best women in the village, his parents thought you were so worn-out to be considered as his "first" wife. In addition, they believed their son deserved an untouched young woman. Finally, he married a beautiful young woman, immediately, after which he was unhappy and miserable to the extent he ran mad and you were the only one who could bring him back to well being. His parents came back to you - this time, after they had eaten their humble pie. They pleaded earnestly, you gave heed and ignored what happened in the past. Eventually, they accepted you as their in-law to be, since you saved their son's life. Nonetheless, shortly, before the marriage ceremony took place, it was prophesied that this man you so much cherished was going to loose his life in a mysterious way if he married you. First of all, the sea lord must be appeased. This was the life of Ihuoma in Eastern part of Nigeria long before the Europeans arrived. The Concubine, however, is not only about Ihuoma, it is also about Adaku, Wigwe, Nnadi, Ekwueme, Wagbara, Anyika and the whole village of Omokachi. The characters in this novel are lifelike; hence, I felt I have met them not read them. Elechi Amadi gave an excellent description of life in the village then. Yet, I was somewhat undecided about rating it five or four stars, at last four because the novel evolved in a slow manner. I guess Amadi was just respecting the rhythm of life in those days and I am glad he took that into consideration. Regardless, at some point I felt long-drawn-out. At the same time, I have to admit that his writing style is superb and the story line was pleasing, some times humorous but with a grievous ending. This novel was used as WAEC (West African Examination Council) exam text for 30 years. It was actually the reason a lot of high school students read it back then in Nigeria. 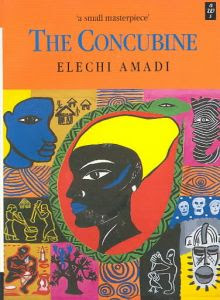 The Concubine is Elechi Amadi's first novel I have read so far, a master piece, I believe his Magnum opus as well. An African classic I wholly recommend to all and sundry. Oh Mary,; I read the Concubine years back and I fell in love with it. Ihuoma was a woman after my own heart. She dared to reach out beyond her customs and to fall in love. Ekueme dared to defy the gods and customs and lost his life in a most terrible way. When the gods have ordained are we mere mortals foolhardy enough to defy them? I believe The Concubine is also about customs, destiny and the human will. Great review, Mary. Afua, I am glad you loved this novel. Ihuoma, I am just amazed she never lost her temper not even once. What an admirable character..... It is just a pity that sometimes even today most families have to interfere in their children's personal life to the extend that they make them miserable. Yes, the Concubine is definitely about customs. For me I liked the theme of attempting to escape your destiny without success. The destiny here being that Ihuoma was to be a concubine but not a wife. I like that fact that the author did say if it was the god that killed Ekwueme or not. Genius! I read it last year (2012) and found it amazing! I like the theme of futility of attempting to escape one's destiny. The destiny here being that Ihuoma is to remain a concubine but not a wife. The author does not tell if it was the god that killed Ekwueme. Genius! I read this last year (2012) and found it absolutely amazing! Thanks for stopping by. Yeah, this is a master piece. An African classic. I am glad you liked it. Indeed its a master piece, I read it some years back but it still fresh in my mind. Thank you Mary for the good work you are doing. Samwel, thanks for stopping by. I really appreciate. Now that Kinna of Kinna Reads is taking a break, I find I am missing reviews of books from African countries, but I am gradually finding a few blogs here and there and am delighted to discover this one too. Lisa, welcome back again, you know your thoughts are always welcome. I added Kinna Reads to my blog list; however, I haven't got the opportunity to interact with her. Hopefully, soon. In my opinion, change is constant and the African society is no exception. This story took place very long time ago. These tradition still affect some / most personal relationships but in different ways. With time and contact with other cultures most people have become quite flexible with the way they establish their relationship. I would say now, it all depends on family and individual perspective and education of course. Again, I would ask someone who was born and brought up in the Nigerian culture, and still remains in it. I love your blog. I had planned to do a review on this very book for this month, goo to see you've polished it well. Hello Sebi... I am glad the review is at your liking. Pls feel free to drop by any time. I would also love to know your opinion on it when you done reading. Thanks. Kboy, hopefully, soon Nollywood would be able to produce challenging movies. I totally agree with you, they've got bunch of stories to tell. Amadi is a classic writer. One of our Achebes. Oh, this is one of my favourites. I can still see images in my mind's eye. I really loved it and hoping to read more from the author. "....and the spirit of death was known to take peoples souls shortly after midnight, and thats how Ekwueme died.... "
kindly help, where do we have this phrase in the book? this should be around the ending of the novel. Please, read it over. ....the concubine remains my favourite African novel, read it many years back, found it about a year later and read it again and it felt like I was reading it for the first time. really wish to see it in motion picture. So do I, I look forward to seeing many African novels in motion picture!! "That was when Ekwueme died"
It's amazing, even now, when I think of it, the places, both physical and abstract, that a book will take you. "The Concubine" made a strong impression on me as a child, and even though I do not have a copy nearby, I find myself revisiting scenes in the novel in my mind, almost monthly. Thank you for your comment, I got your message on Facebook too. This novel Must have left you with a strong impression. Thank you for your kind words. Highly appreciated.